We've Arrived in the Bahamas! About the trip . . .
What is there to say about our trip that I haven't already told you?.... Hmmmm. My previous note touched on many of the highlights of the trip here from Virginia, so I'm not sure what to add to that, if anything. The key thing which I mentioned last time but that's worth repeating because it's so very important is the way that the guys watched the weather reports and modified our planned route in order to avoid Tropical Storm Debbie. That proved to be the key to ensuring a safe and enjoyable trip here. Thanks to their great planning our trip here was very uneventful and I don't have any horror stories to entertain you with. Had we taken our original route then things could have been very eventful. Our route here took us along the coast line down and around Cape Hatteras, then west until about a little past Beaufort North Carolina. We wanted to be able to duck into a safe harbor if the weather forecasts about Debbie were wrong and she turned our direction. However, it turned out that we didn't need to duck into any harbors at all. Once we were confident that the threat from Debbie had passed then we turned away from the coast and headed straight for the Bahamas without ever touching land after leaving Virginia. 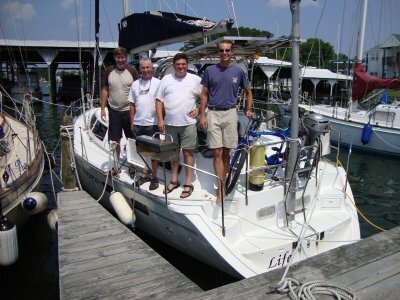 The total distance we put under our keel after leaving Virginia and before arriving here was 858 nautical miles. Some of the crew were seasick at first, but it didn't take them too long to get their sea legs and then everyone was fine. The crew got plenty of practice handling the boat in a variety of wind and sea conditions, from calm sunny days to "lively" windy ones. And of course, my favorite... we enjoyed many night of sailing under skies packed with beautiful stars. The trip here took us a little less than seven days. We could have arrived even sooner than we did, but a day or so out from making landfall we calculated what time we'd arrive if we maintained our speed and the answer turned out to be the middle of the night. We didn't want to do that and so we slowed down in order to get here at about nine in the morning... the time that we figured the customs and immigration people would be ready to process our entry into the country. 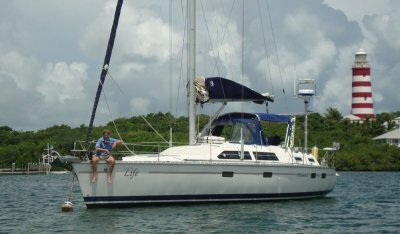 When we got here we took a day to reprovision, do laundry, make minor repairs, and then we took off for some of the outer islands. 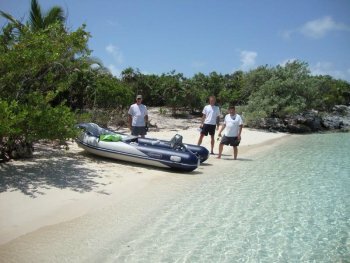 We wanted to go to places that people who fly here and charter boats aren't able to go (because the charter companies require their customers to stay close to their base). 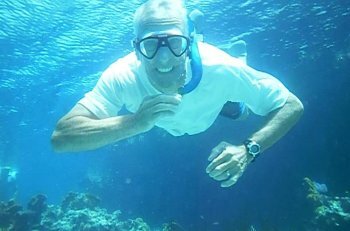 We spent about a week and a half in the Exuma islands snorkeling, exploring, and having a great time. 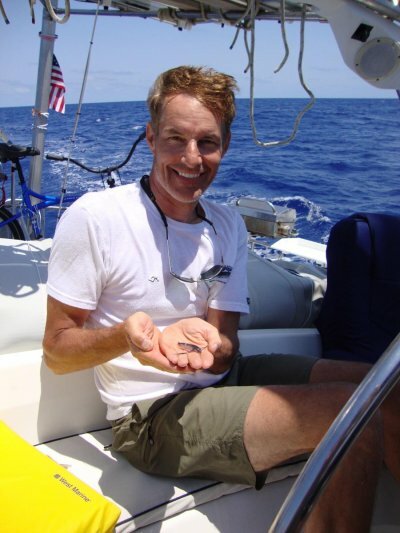 By the time all was said and done, we had put over a thousand and three hundred miles under the keel. The crew is now very experienced and ready to sail off on their own. They are all now accomplished offshore passagemakers. I'll attach several photos. Feel free to pick some for your newsletter. Hopefully you've already seen the SPOT update telling you that we arrived in the Bahamas earlier this morning. The plan for today and tomorrow is to take care of various chores that need doing... laundry, minor boat maintenance items, etc. Then we'll probably head off in search of some beautiful remote anchorages where we can snorkel, dive, or just relax in solitude. 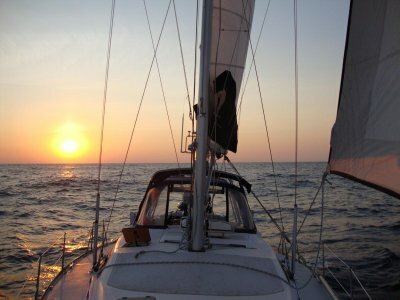 The passage certainly could have been more exciting if we had taken our original route and then been caught out at sea when Tropical Storm Debbie came through. However, thanks to the careful planning of our three newly certified offshore passagemakers, we avoided that. I think you'd all be proud of how well your particular loved one did. They were a great crew.... and they were great captains too, seeing as how they all took turns being "captain for the day". There is one thing where I'd appreciate a little help from all of you readers. We had a contest to see who caught the "best" fish. 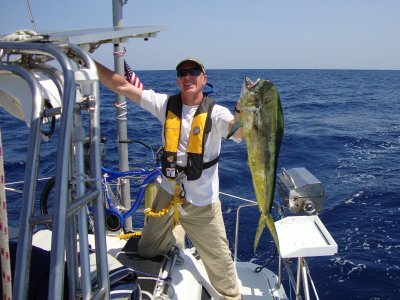 I'll enclose photos I took of a fish that Trevor caught during the passage and one that Martin caught. 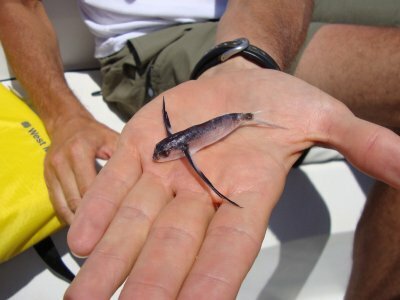 We're not sure who to give the prize to for "best fish caught". Which one do you vote for? 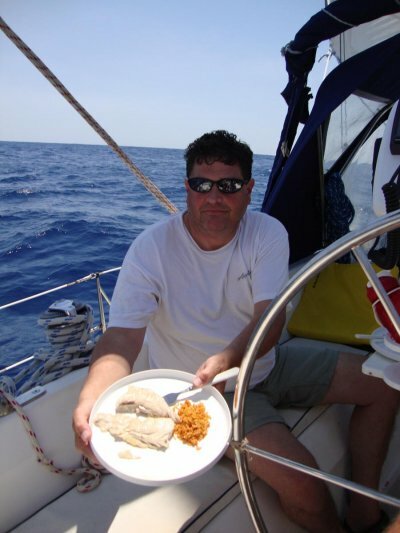 You can see from the photo of Ron enjoying Trevor's fish for dinner that he definitely liked Trevor's fish. And then of course there are the dolphins. 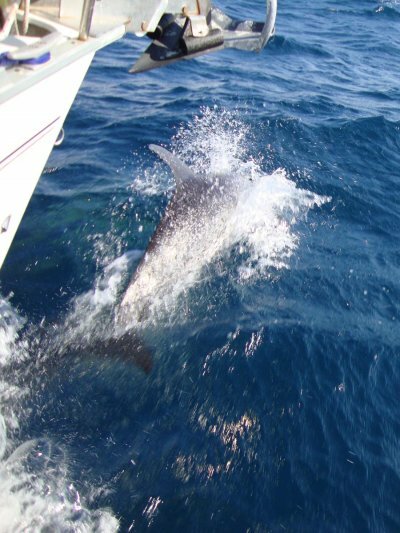 As has happened on so many of my journeys, we had dolphins dancing at the bow on a couple of occasions during our trip. I've enclosed a photo of one of them. That's always a magical thing to see. Oh and finally, there's the obligatory sunset photo with the boat in the foreground. No photo collection would be complete without that. Seeing as how it's always a good idea to file a "float plan" with someone back ashore before heading off on a sailing trip... even a simple relaxing one like what we've got planned for the next several days... here's our float plan for the next several days. We're going to leave Marsh Harbor this afternoon and then sail south. 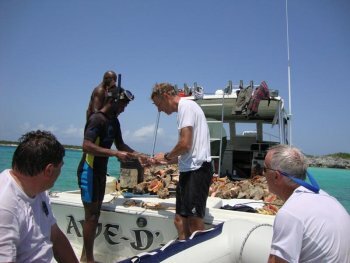 We'll cut in between Eleuthera and New Providence Island in order to get into a region called the Exuma Sound. 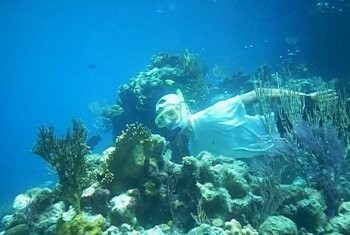 There's an area there that's one of the oldest marine nature preserves in the world and is supposedly really great for snorkeling and exploring. We'll hop from cay to cay down there, snorkeling, exploring, and just relaxing. 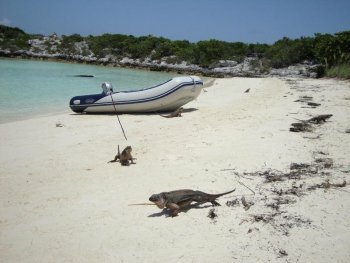 I can't say for sure which cay we'll be at on any given day since we'll just play things by ear, except I can say for sure that by Sunday we need to be at a place down there called Staniel Cay. Ron is flying home from there on Sunday. After he leaves then Martin, Trevor, and I will sail back to Marsh Harbor. I'll send daily position updates via the SPOT satellite system so that you can know where we are. I've set up my two allowed SPOT message options (which I have to do now... before leaving port) so that one will say we're exploring as per the float plan in this e-mail message, and the other will say we're headed back to Marsh Harbor. Message:We're still island hopping as per the "float plan" I described in my e-mail message. Life is good. Message:We're en route back to Marsh Harbor. Message:We're back in Marsh Harbor, minus Ron and now plus Kym. I won't be sending any more SPOT updates. Message:We have arrived, safe and sound. I'll send more info after we get cleared through customs and such. Message:We're now on "Plan B" (heading straight for the Bahamas). Here's our current position. Message:We're still on "Plan A" (to stop in NC.) Here's our current position. Hello everyone on the sailing distribution list. 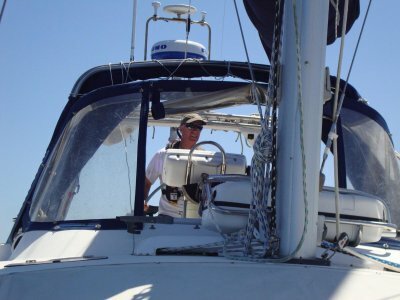 This is Doug with the first of what will hopefully be daily updates on the progress of our little sailing venture. We are going to cast off the dock lines and head out as soon as I send off this e-mail note. The attached file is a photo of the happy crew that we just now took. Hopefully we'll all still be this happy when we arrive. Plan A is what we'll do if the forecast that we see at that time shows that bad weather is ahead of us. In that case we'll stop somewhere in North Carolina... probably Beaufort... to hide in a nice safe harbor. Plan B is what we'll do if the weather forecast looks good two days from now. In that case we'll just continue on to the Bahamas without stopping anywhere. I've got my SPOT satellite transmitter set up to send one of two possible messages, depending on which of two possible buttons I push. I have to set up the text of the message now... before I leave port... so I have to keep the text generic. The message you receive each day will tell you exactly where we are at that time (with a link to a map showing our location) and it will also tell you whether we're on Plan A or Plan B at the time. The first few messages... prior to the time we reach Cape Hatteras... will say we're on Plan A even though to be honest we won't have actually reached the decision point yet. The messages that you receive after we pass Cape Hattaras will be the first ones where the "Plan A/ Plan B" reference will really have any meaning,. OK then. I guess we're off! ...and we have reason to want to. We're looking at the weather forecasts and getting very unhappy with the forecasters. NOAA is predicting one thing, PassageWeather.com is predicting something different, and Sirius Weather Radio is predicting something still different. NOAA isn't yet making any predictions at all about what direction Tropical Storm Debbie is going to go. PassageWeather.com seems to think it will head east, cross Florida, and become something we need to contend with. Even if Tropical Storm Debbie wasn't there, there's another weather system crossing our path that might or might not become a problem for us. However, it's not a problem right now and won't become a problem (IF it ever becomes one) for a few more days. Thus the incentive to leave tomorrow but on a rather modified float plan. What I'm thinking right now is to maybe possibly perhaps leave tomorrow (Monday) rather than Tuesday and then hug the coast line down to Cape Hatteras rather than going straight out into the blue water immediately. By the time we get to Cape Hatteras, the forecasters will hopefully know more about what Debbie and her friends are going to do. Then depending on what they say we could either cross the Gulf Stream at Cape Hatteras and head for the Bahamas (if the forecast at that time looks good) or else round Hatteras and duck into Beaufort to hide from the oncoming storm (if the forecast at that time doesn't look good). We're going to look at the weather forecast one more time tomorrow morning and also discuss our plan with some locals who know the waters better than I do. If it turns out that we leave tomorrow I'll send you a note telling you that before we go. I took a few pictures today but they're not very good ones. We only sailed for a very brief time because the winds were so very light. 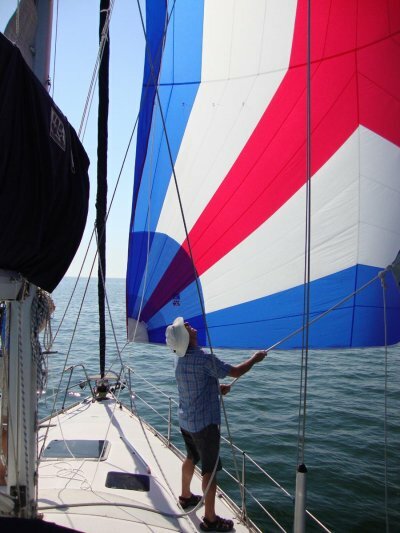 I did put up the asymmetrical spinnaker, so there is a bit of color in the photos. But other than that they don't have much redeeming value. You be the judge. They might be the only pictures you'll get... if we actually do leave tomorrow. It's still too early to say for sure when we'll cast off, 'cause the weather forecasts don't quite go that far out, but here's the tentative plan. I'll pick up the crew in Washington DC on Saturday and bring them down to Deltaville that evening. 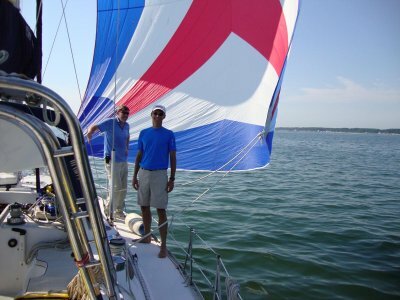 We'll spend the mornings and early afternoons of Sunday and Monday sailing on the Chesapeake... doing man overboard drills, playing with the trysail and spinnaker and stuff. I probably won't actually switch over to the storm jib. It's more trouble than it's worth, but I'll bring it up on the bow and let everyone see it and talk through how to put it on if we have to. (With my roller furling jib I don't really need a storm jib, but I have one just in case my jib gets shredded for some reason.) I haven't decided whether or not to actually deploy the parachute sea anchor. On the one hand it would be very good to have the crew actually deploy the sea anchor once under calm conditions before they need it under bad conditions, but on the other hand I don't want to pack a wet parachute in the boat for our long journey. We might just bring that out on the bow and talk through it without actually deploying it for real. We'll spend the late afternoons and evenings of Sunday and Monday at the grocery store getting provisions. If the weather is good then on Tuesday we'll head out. If the weather doesn't look so good, then we'll wait until it does look good. 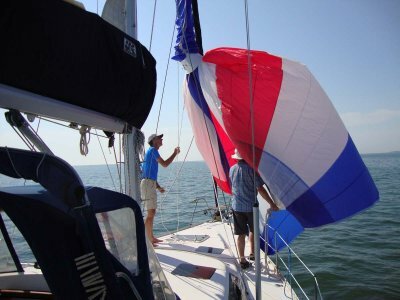 I'll take lots of pictures during the practice sailing that we do on Sunday and Monday and e-mail them to you before we cast off for real, so that you can have something to put in your newsletter after we leave VA but before we arrive in the Bahamas. While we're underway you'll have the daily SPOT update. When we arrive I'll send you photos that we took along the journey.